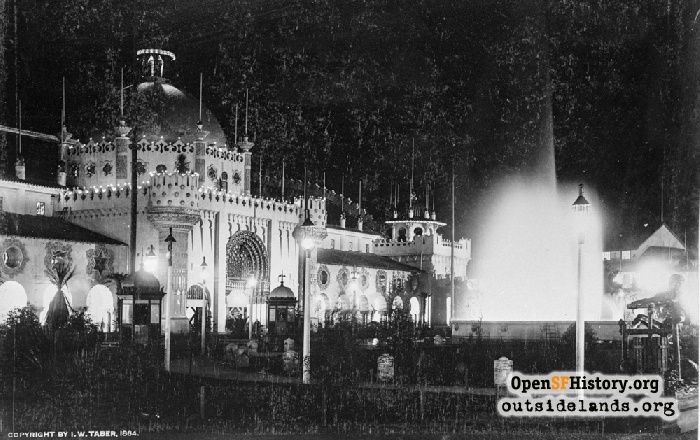 The site of the largest building at the California Midwinter International Exposition of 1894—indeed, the largest structure in the whole state at the time—is today mostly trees and open space on the east side of Golden Gate Park’s Music Concourse. 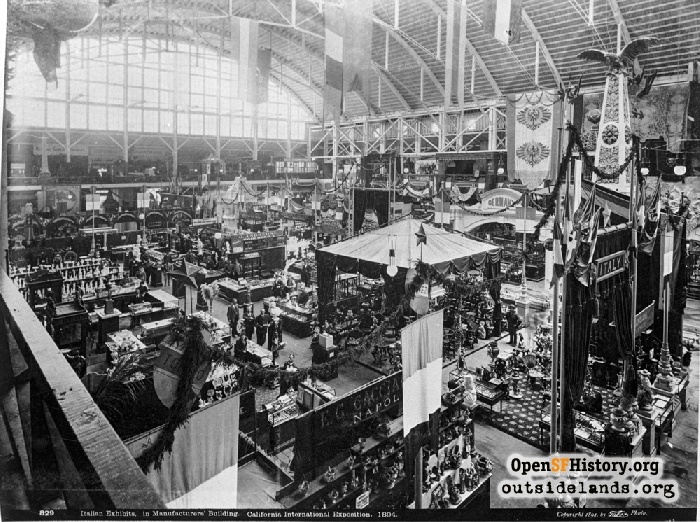 The Manufactures and Liberal Arts building housed the mercantile exhibits of the exposition, where everything from buggy whips to fur coats to billiard tables were on display. Designed by Arthur Page Brown, the crème-colored temple to commercial goods was described in the Official History as “Moorish in style, with a strong suggestion of the California Mission architecture.”1 A center dome, turquoise blue and surmounted with a golden cupola rose 130 feet above the main entry. Flying above the crenellated cornices were flags of the various nations that displayed their wares inside. Inside one of the corner towers was a set of chimes that rang out daily concerts. 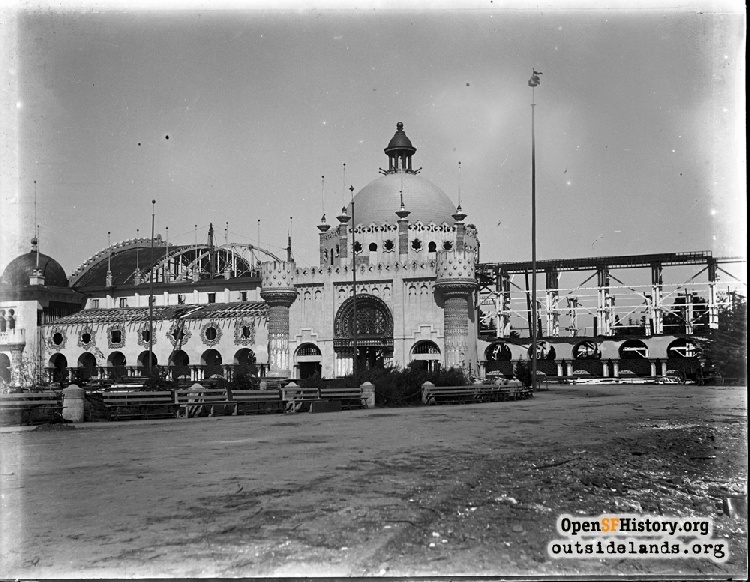 The 462' by 225' building had an annex that extended another sixty feet on the east, an elevated gallery encircling the main floor, and a colonnaded walkway across the front with Spanish tile on its walls. 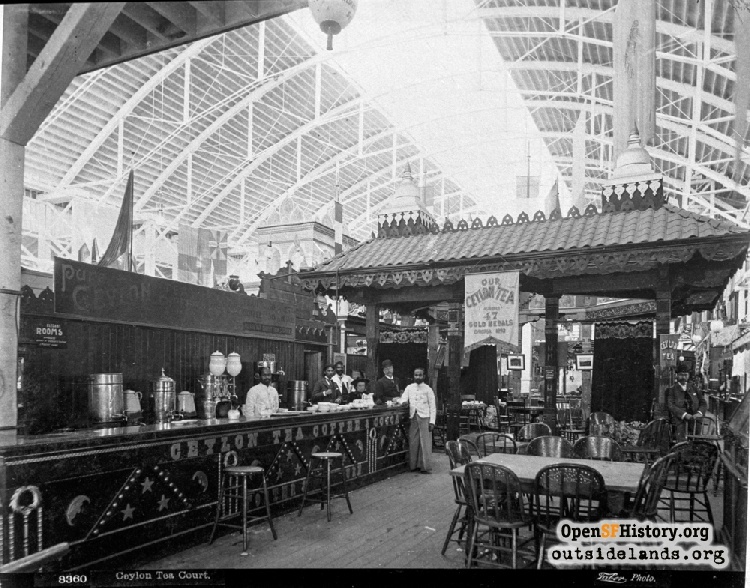 An enormous arched roof made of 14,000 square feet of glass allowed daylight to stream in, highlighting soup spoons, crystal vases, ladies fans, and other sundry imports from around the world. The view of the main hall, which was the size of a city block, is probably best imagined in contemporary terms as a massive modern tradeshow in a big city convention center. 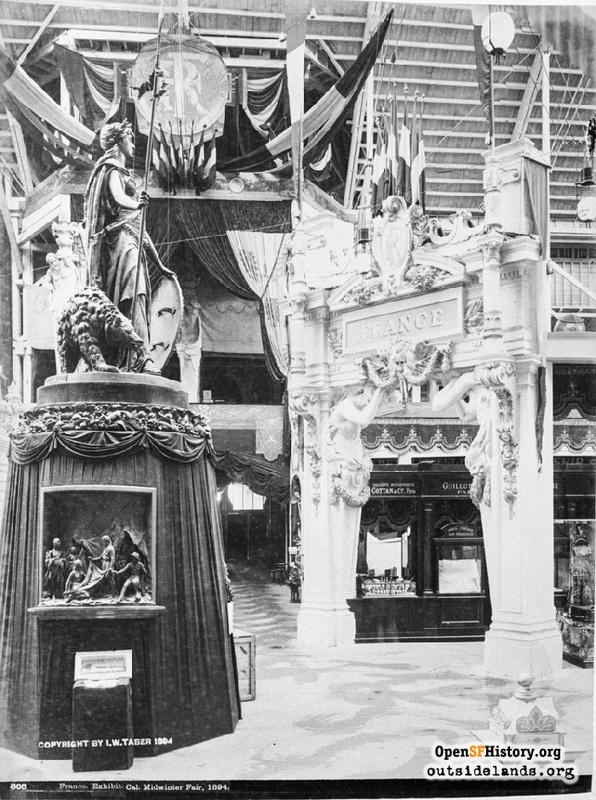 The official exhibits of Italy, France, Germany, and Russia occupied corners of the hall’s main intersection, overseen by the statue of Athena as California, which later would top the James Lick Pioneer Monument in the Civic Center. Each country mostly recycled their exhibits from Chicago’s 1893 Columbian Exposition: imposing gateways, columns, pedestals, cabinets, and tables all surrounded, covered, and stuffed with a mind-numbing array of export goods and broken up here and there with heroic statuary and stuffed bears. 1. 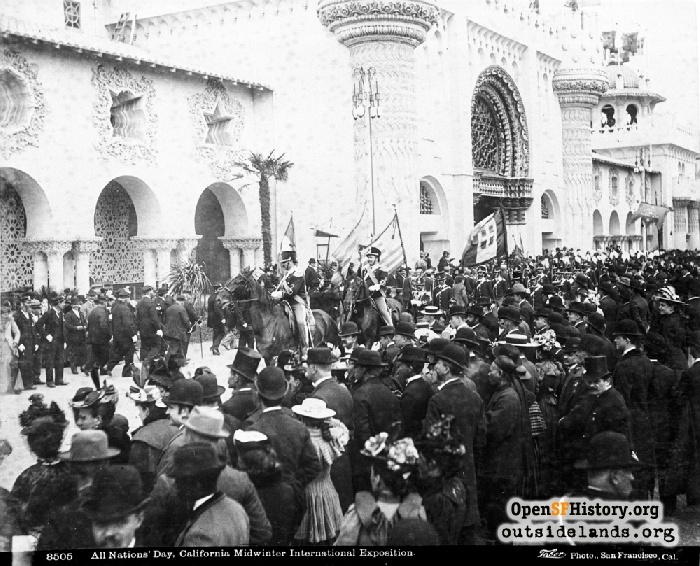 The Official History of the California Midwinter International Exposition, (San Francisco: H. S. Crocker Company, 1894), pg. 48. 2. "Palace of Manufactures and Liberal Arts," San Francisco Examiner, January 28, 1894, pg. 32. 3. The Official History of the California Midwinter International Exposition, (San Francisco: H. S. Crocker Company, 1894), pg. 113. 4. "Palace of Manufactures and Liberal Arts," San Francisco Examiner, January 28, 1894, pg. 32. 5. 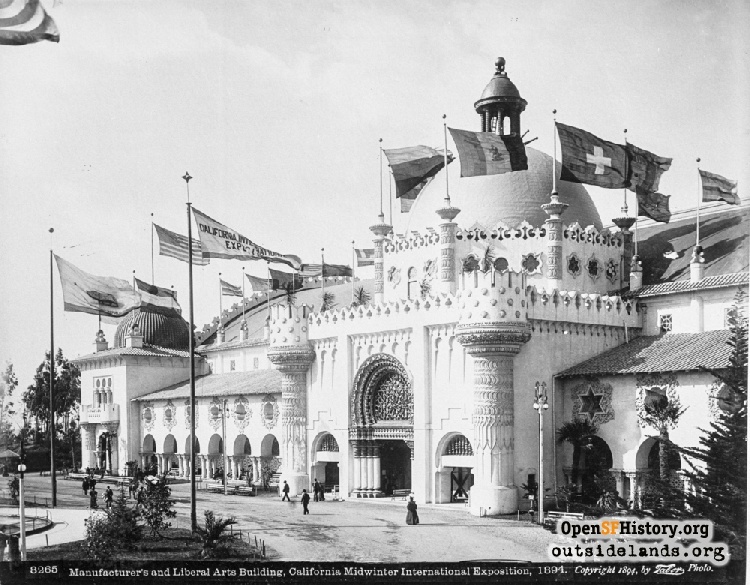 The Official History of the California Midwinter International Exposition, (San Francisco: H. S. Crocker Company, 1894), pg. 251; “Tea Table Gossip,” San Francisco Call, September 5, 1894, pg. 10. 6. The Official History of the California Midwinter International Exposition, (San Francisco: H. S. Crocker Company, 1894), pg. 114. 7. “Sure Things,” Oakland Weekly Tribune, June 30, 1894, pg. 3; “He Will Stop that Fiesta,” San Francisco Examiner, June 15, 1894, pg. 12; “The Slot Machine Swindle,” San Francisco Examiner, July 1, 1894, pg. 13. 8. 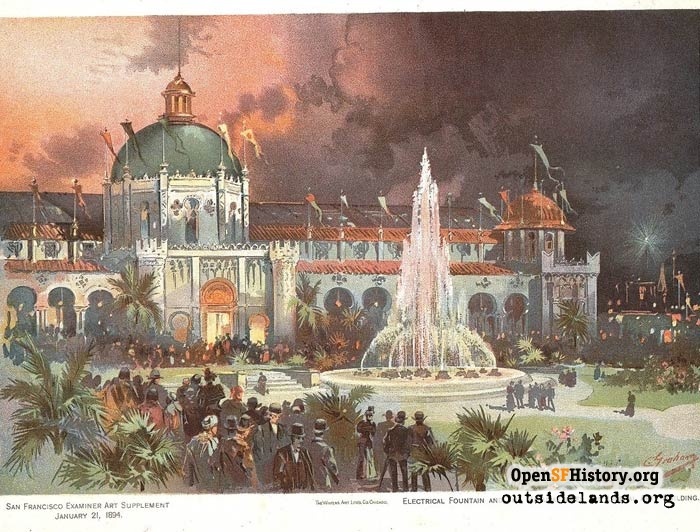 The Official History of the California Midwinter International Exposition, (San Francisco: H. S. Crocker Company, 1894), pg. 192.